Congrats to the Lexington Cannons of BAYS on their Undefeated Season 9-0! 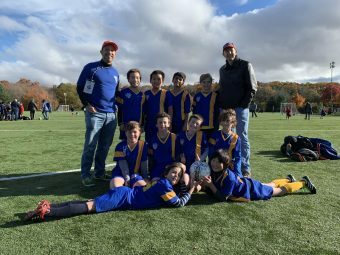 Congratulations to the U10 Lexington Cannons of BAYS Section 4E on their undefeated season, 9 – 0! Even the rain couldn’t stop them! In keeping with the LUSC philosophy, the boys rotated positions throughout the season and were exposed to both offense and defense with 5 different players serving as goalkeepers throughout the year! A big thank you to Coach Tom and Rob for coaching and mentoring the boys!